A Sheffield garden design expert has been travelling the world, sharing his thoughts on how fresh air and the sense of wellbeing that comes from being outside can have a relieving impact on the effects of dementia. Dr Garuth Chalfont began his career as a landscape gardener before going on to complete a PhD in architecture at Sheffield University. He has since been redesigning gardens with a view to improve the lives of those with the disease and now hopes to set up a new project entitled Dementia Beat Camp. While brisk walks in the fresh air have long been encouraged as a boost to health and are understood to promote a positive psychological response, Chalfont suggests that this could actually impact on the memory abilities of dementia sufferers. Chalfont has been going around the world sharing his knowledge and skills in creating therapeutic outdoors environments for dementia sufferers and wishes to continue his quest to promote the underestimated effects of being outside. It is thought that time spent outside playing croquet or enjoying the light walks and gardening opportunities such as those available in the landscaped grounds of Bridge House care home in Abingdon can have a significantly positive impact on both memory and brain function. As Chalfont said in this article, “If a resident goes out into the garden and it’s pleasant, then it sticks. The next day they might remember it”. While there is much research into the importance of vitamin D and how exercise can reduce the symptoms of dementia, the experience of going outside and the pleasure it can bring alone can have a positive effect. Even when it is raining in Abingdon, residents can still enjoy the benefits of the home’s beautiful green areas with the Bridge House indoor garden, which brings the outside in so that residents still get that revitalising feeling of being in the great outdoors. 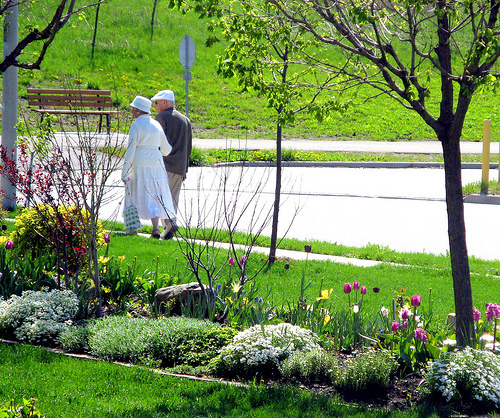 Chalfont recognises the importance of the garden in such care homes and is looking to increase awareness of the importance of a garden’s design for residents with dementia.